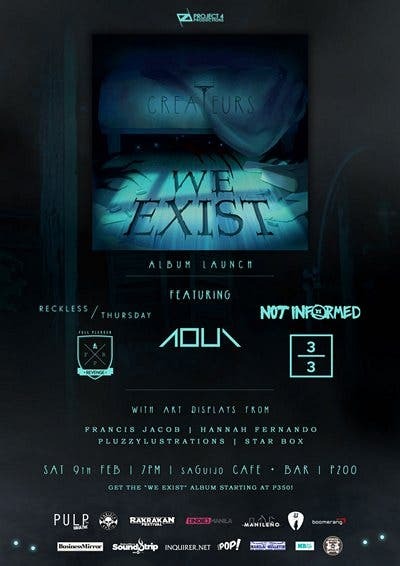 The existence of independent rock band Createurs will not be a secret anymore with the launch of its debut album We Exist happening on February 9, 2019 at sa Guijo Café + Bar in Makati City. Createurs is a Manila-based collaborative band that teamed up with artists from the local underground music and art scene to create this 12-track themed album. Each song, which represents a metaphorical monster, features a musician for either backing vocals or instrumental tracks and an artist for the track artwork. Thus, We Exist is Createurs’s way of showcasing the talents of these underground musicians and artists to serve as a statement that they exist. This album launch event will be supported by music performances from other local rock bands: Aoui, Full Pledged Revenge, Not Informed, Reckless Thursday, and Thirds. It will also feature art displays from underground artists: Francis Jacob, Hannah Fernando, Pluzzyllustrations, and Star Box. Get your tickets for only P200 each and the We Exist album starting at P350 at the venue from 7 PM onwards. For more details, visit Project 4 Productions on Facebook. The Fifth UST Model United Nations is now in order!